The effect produced by it upon the traveller, when on a dark night he comes suddenly upon it glowing in the woods, is startling; for to a person unacquainted with this phenomenon the pale, livid, and deadly light emanating from it conveys to him an impression of something supernatural, and often causes no little degree of terror in weak minds or in those willing to believe in supernatural agencies. 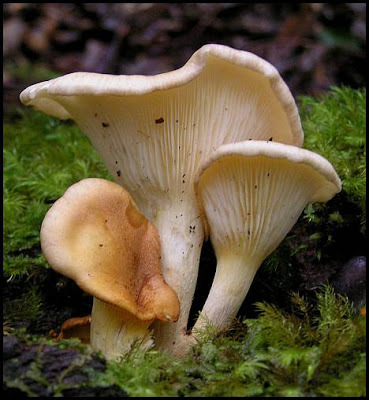 Hello, my name is Paige Rudolph and this webpage is dedicated to the Ghost Fungus, Omphalotus nidiformis (pronunciation Omfa-lotus nidee-form-iss). My website is one of many that belong to MultipleOrganisms.net, a project created for Organismal Biology students at the University of Wisconsin-La Crosse. Omphalotus nidiformis is a basidiomycete mushroom found in Southern Australia. It is the most known mushroom in Australia due to its bioluminescent properties. O. nidiformis is a saprotroph, which means this organism feeds on the cell contents, tissues, or bodily fluids of another species. This organism can be found at the base of dead or dying trees. It is poisonous but not lethal, leading to severe cramps and vomiting. If you would like to continue learning about Omphalotus nidiformis, please continue on to the Classification page.